I’m Dan Anderson, Renegade Paint Repair Specialist with Newlook Body Works. I own a mobile body shop having served car dealerships for over 25 years. I have recently revealed my secret service for car dealerships to the public. If your car had minor paint or bumper damage and you took it to the dealership’s body shop to repair, they would call me to fix it. Then they would charge you a substantial markup! Car dealerships have been using my service for decades. Your knowledge of my existence is something they don’t want you to know about for obvious reasons. They want to facilitate the repairs by acting as the go-between while not actually doing any work! They charge you an enormous markup for picking up the phone and calling me after you drop your car off for repair. This is why I’ve revealed myself and am now offering my service to you. Without the car dealership and their unreasonable mark-up. The service that they have kept to themselves is now available to you exclusively. My service has been their “dirty little secret” for a long time. Not anymore. When you have a scraped bumper or a scratch on your car, your first thought was to take it to the dealership or an independent body shop. Now, body shops have their place, mind you. If you have severe damage, a crushed door panel or front end damage due to a collision, then yes, a body shop would be the only option. But for minor repairs, the body shop is not your only option. In fact, it is your worst option. Clients, time and time again, tell me of the horror they feel after the guy doing the estimate at the body shop says that, for minor damage, they will need to remove parts, paint large sections of the vehicle, keep it for a week, a CARFAX report will be triggered, unable to warranty it because of the difficult color. . .and the outrageous price. . .All this for that little scratch? Send Me Your System For Writing Emails That’ll Forever Eliminate “Trial And Error” And Give Me An Unfair Advantage In My Marketplace! 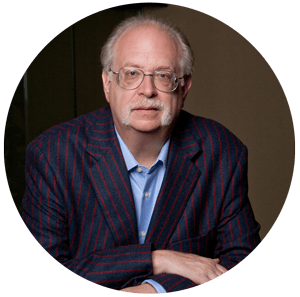 Discover Dan Kennedy’s Uncommon System For Writing Compelling Emails That Get Opened, Get Read And Build Long-Lasting Relationships With Customers, Clients And Patients—Resulting In More Money In Your Pocket. Get The ONLY Comprehensive System and Set of Tools Crafted by GKIC’s Experts From the Ground Up to Transform Email From A Haphazard “Shoot-from-the-Hip” Guessing Game Into A Scientific Marketing Machine That Delivers Predictable, Powerful Results for Your Business Over and Over Again. I’m going to show you how to create an automated engine that can help you grow your business without buying more traffic, adding more people to your list, and working 60-80 hours per week. This is the “secret sauce” behind the GKIC marketing engine, and we’re revealing it today…so you can effortlessly “move” it into your brick and mortar or online business. So whether you’re a lawyer, dentist, doctor, chiropractor, butcher, flower shop, or online retailer, this will be your key to inexpensively keeping in touch with your prospects and building relationships with your customers, clients or patients so they’ll trust you and BUY from you. You see, most business owners mess up their email marketing campaigns. They think that ANY communication is better than NO communication at all. Either that, or they practice a “churn and burn” style of sending emails where they bombard their subscribers, customers, clients or patients…leading to a fatigued list that no longer trusts them…or BUYS from them. Sorry to say, but this is just for amateurs and less-than-sophisticated marketers who are mentally stuck in 2003 with their email marketing campaigns. Otherwise, you’ll constantly have to replace your dead and dried up subscriber base…plus you’ll potentially burn your rep into the ground. You see, there is a more sophisticated method for creating email campaigns that doesn’t require you to be a top-gun copywriter, master marketer, or have over 40 years of experience like me to create. It’s like building a house. Would you just lay a bunch of bricks, mortar, plywood, shingles, and siding in a pile and call it a day? Heck no…you’ll end up with one big mess. That’s why architects create the house before it’s been built through blueprints. That way the contractors know where to put each brick, nail each 2 x 4, and place each piece of siding. And, in the same vein, you’re probably taking a similarly haphazard approach to writing your emails. Or you’re cheating your existing email sequences because you are constantly staring at the computer screen wondering what to write next. So, for the first time ever, I decided to “shamelessly steal” the idea from my best-selling course Magnetic Marketing and create an “email only” version that allows you to create your own email marketing campaigns. You’ll get copyright free email campaigns you can swipe from, steal, borrow and implement for your own email campaigns. There’s plenty of stuff here…from subject line templates, holiday email promotions, referral campaigns, you name it. The pain, agony, stress and struggle of writing emails will permanently go away…and creating your own campaigns will instantly go from difficult to EASY. You’ll also stop procrastinating on creating those email sequences you KNOW you should be creating…and probably should have created months and YEARS ago. That’s because you’ll have a proven foundation from which you can simply “hang your words” and crank out money-making email campaigns that puts more money in your pocket. So if you’ve struggled with writing emails, rest assured that it’s not your fault! The Magnetic Email Marketing System & Toolkit contains everything you need to write compelling emails that get opened, get read, and build long-lasting relationships with customers, clients and patients. This is a more sophisticated and less “salesy” way to communicate with your prospects, customers, clients or patients that doesn’t require you to bombard them with sales messages that’ll eventually fatigue your list. You see, there’s a reason I have “lifers” who have been with me for 5, 10, 12, and 15+ years. If I send them pitch after pitch…offer after offer…then they’ll leave me in a matter of months. The Magnetic Email Marketing System & Toolkit is all about building relationships with customers, clients and patients so they’re fascinated with you. This totally shifts the dynamic of the prospect-customer relationship where you become a magnet and people are pulled to you. They look forward to getting your emails in their Inbox. They treat you like a welcome guest instead of an “annoying pest” like most marketers. Best part? They’ll BUY from you because you’ve built a relationship with them…and they know you have their best interests at heart, and put real value in the offers you make. …resulting in having you to replace this dead or diseased herd with fresh names you can “churn and burn” again. Listen: the hardest part of business is getting qualified leads onto your list. So you might as well keep the ones you have and build a relationship with them…so they’ll never leave you. …and not “pretenders” who don’t email very often, have no strategy when sending out emails, or write emails that get ignored or chucked in the Trash folder. Gone will be the days where you have to beat your head against the wall trying to come up with ideas for the emails you have to write. You’ll now have a system you can reliably “lean on” for the rest of your wealth-building career that’ll take the frustration out of writing marketing emails. • Money-Making Component #1: You’ll get your own comprehensive copy of the 4-hour probative training session I did with the GKIC’s Dave Dee. You’ll also get an easy-to-follow transcript you can use to follow along, take notes, and leverage for your own business. We really designed this in a cookbook format to make it easy for you - just follow the email marketing recipe and you’ll be successful. • Money-Making Component #2: You’ll get copyright free email marketing documents you can take and use to get almost immediate results. These templates are literally [FILL IN THE BLANK] so you can easily fill in your product or service and you’re all set. There are a variety of promotions you’ll be able to effortlessly swipe—including Holiday promotions, Subject line templates, Birthday campaigns, and much more. • Money-Making Component #3: You’ll also get an utterly irresistible swipe file that’s filled to the brim with 23 marketing examples you can learn from and model for your own email campaigns, including a complete launch campaign, landing pages, sales pieces, lead generation and way more as well. In fact, it could be an advantage that you are not “that great” because most copywriters and marketers tend to over analyze, over think, perfect, etc. which wastes time and delays implementation. We recommend that you just “fill in the blanks” with your business details and send out these emails as-is — instead of trying to complicate things. That’s what the Magnetic Email Marketing System & Toolkit is designed for…to remove a lot of the “hard work” that goes into creating an email campaign. For example…when you want to create a referral campaign, just take the copyright free referral templates in the package, insert your business name, product name, etc. and BOOM…you’re done. And when the Holidays come around, just take the Holiday promotion examples, replace the [FILL IN THE BLANK] placeholders with your business details and BAM…send it out and watch the sales come in. So How Much Is It Worth To You To Create Cost-Effective Email Marketing Campaigns On The Fly That’ll Boost Your Bottom Line? I’m not going to waste your time talking about how I tossed and turned in bed, asked my clients, and talked to my “guru” buddies about how much to charge for this package. Email marketing is an integral piece of any marketing plan for a brick and mortar business owner or online retailer, and a wonderfully CHEAP way to keep in touch with your prospects and customers…and put your profit-making on autopilot. Sure, it’s cheap to send out emails, but consider the time cost of writing emails for your business…including hiring an experienced copywriter to write these campaigns for you…the cost could run in the tens of thousands of dollars and up. But I’m here to empower you to create your own email marketing campaigns that automatically bring in referrals to your business without spending a lot of time and money. Taking action on this package will surely save you thousands of dollars in the long run…so even an investment of $1,497 would be well worth it. Considering you could hire a copywriter for 2-3x that price…someone who doesn’t know your business as intimately as you do and whom you’ll probably have to go back and forth with until they finally “get it”…that price is well worth it. You won’t have to pay that when you take action on this program, the price is ONLY $497. That’s barely 3 months of cable television or cell phone bills, but you’ll be able to generate bullet-proof email marketing campaigns based on “what works” for GKIC and our clients—so you don’t have to pull your hair out wondering how to create your campaigns. The investment essentially equates to being less that 1% of a $100,000 per year income. And, knowing how “good” my stuff is and the fact that I am the highest paid copywriter on the planet, it’s a no brainer that you’ll get at least a 1% “bump” in income when you implement this training. Heck, you could probably look on your calendar, see that there’s a holiday coming up, copy and paste one of the copyright free holiday promotions from this System, stick in your business and details, and click SEND. That one email alone could more than make up for the cost of this System! So, in reality, this System doesn’t “cost” anything. It’s an investment in your future wealth-building career—where you’ll be able to generate email campaigns that put a majority of your marketing on autopilot. That’s right, just like what Ron Popeil says…just “set it and forget it”. Modern Traffic School will show you want's working now to get traffic to your website or storefront thanks to six experts who know how to summon a surge of traffic almost overnight. Includes the likes of Pat Flynn, Mike Stewart. Craig Simpson, Jermaine Griggs, and Jeff Johnson. They will show you how to build your list…AND each includes an action checklist of exactly what you need to do. This is HOT up-to-the minute information from today’s lead generation pros who will show you how to generate customers on demand. This Special Fast-Action Bonus Disappears Immediately on Tuesday, July 25th At Midnight So Take Action Right Now To Get This "Must-Have" Bonus Worth $497! Finally, to remove ALL risk to you, if at any time during the first 60 Days after receiving your copy of the “Magnetic Email Marketing System and Toolkit” you honestly believe you’ve made a mistake or are disappointed, you will receive a 100% refund of any fees paid. But I know that when the Magnetic Email Marketing System & Toolkit lands on your doorstep, you’ll flip through the templates, go through the example marketing campaigns and examine the pages of subject line examples that’ll save you tons of time by itself, you’ll decide that this package is a keeper. 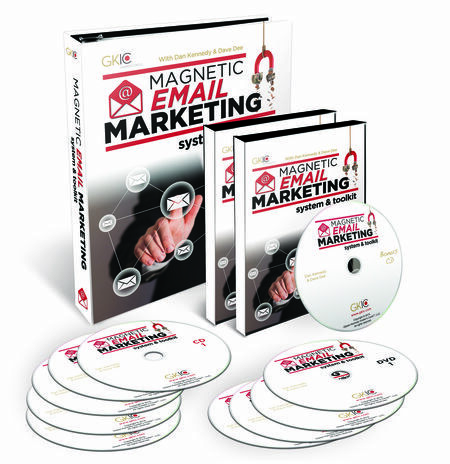 In fact, I know that The Magnetic Email Marketing System & Toolkit will be as useful to you as all 6 editions of the original Magnetic Marketing course has been to brick and mortar and online businesses for the past 22 years. 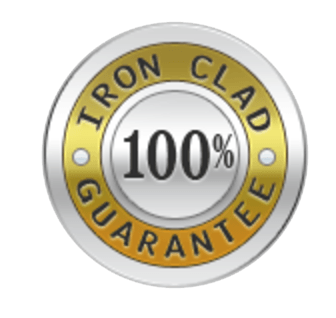 GKIC gets a lot of requests from previous buyers of Magnetic Marketing for a new course because they wore out their original…they’ve used it so much! And I’m sure we’ll get similar requests 6-12 months from now since The Magnetic Email Marketing System & Toolkit is a money-making reference you’ll refer to again and again every time you sit down to write an email campaign. If you’re not effectively using email as a brick and mortar or online business, then you’re missing out on a extremely cost-effective way to keep in touch with your customers, clients and patients so they’ll trust from you and BUY from you. Unlike most marketing systems where there’s a huge outlay of cost, time and resources, you can start sending out targeted email campaigns as soon as tomorrow. All you need is an autoresponder, and a landing page, and you’re all set. Sure it’s cheap, but email is an easy thing to botch up. Many businesses…including service / professional / brick and mortar / etc. have seen their open rates decline, their response going down the toilet, and their ROI suffering over the past couple years because the “churn and burn” philosophy for sending emails no longer works. So you can ignore the power of email and keep using your current marketing strategies that are giving you “OK” results. Or you can invest in The Magnetic Email Marketing System & Toolkit and start spreading your business reach locally…and beyond for very little cost. Thanks to the copyright free templates, subject line templates, ready-to-use email campaigns and promotions, you could be up and running in a matter of hours. So if you currently have an email list and have seen your open rates and responses decline, then this is the “fresh blood” you need to resurrect that “dead” list and start putting more money in your pocket. If you’re reading this, the deal is ON. Order the Magnetic Email Marketing System & Toolkit right now, while it’s still fresh on your mind. Get ready to create emails that get delivered, get opened, get read, build relationships with your customers, clients, and patients and put more money in your pocket thanks to what’s working now in 2017. Send Me Your System For Writing Emails That’ll Forever Eliminate “Trial And Error,” Give Me An Unfair Advantage In My Marketplace, And Bring More Certainty And Predictability In My Brick And Mortar Or Online Business. I know that email is a critical part of a marketing plan, but I realize I don’t have a set of tools that allows me to create email campaigns on the fly so I’m not staring at the computer screen what to write next. I also know that writing just pitch emails ain’t gonna cut it anymore in 2017, and I need a more sophisticated way to write email campaigns. I know that I could see BIG returns from this little investment since just one hour of my time (or time spent hiring a copywriter to do this for me) will more than make up for the investment in this program. And I know I’m covered by your Zero-Risk Unconditional Money Back Guarantee, so there’s no way I can make a mistake here. I can try the Magnetic Email Marketing System & Toolkit in my own business, implement it, and see if I can get an immediate return on my investment. If not, I can return it for a no-hassle refund…no questions asked. Yes Dan, I’m ready. Please send my copy of The Magnetic Email Marketing System & Toolkit so I can write compelling emails that get opened, get delivered, get read and put more money in my pocket. Dan Kennedy's "Magnetic Email Marketing System & Toolkit"
P.S. If you’re hesitant, need to “think about it” or consult with the spouse, then consider this: hesitation is the language of the poor! The true action takers and “movers and shakers” who see opportunity pounce on it…and the pretenders who have to always “think about it” and eventually talk themselves out of everything will forever be stuck in the status quo. So in which group do you belong? I know my “lifers” and the GKIC Elite are going to take action on this…the “top 1%” business people who hate hesitation. So now’s the time to escape the “mediocre majority”…invest today. 2017 - GKIC. All Rights Reserved.